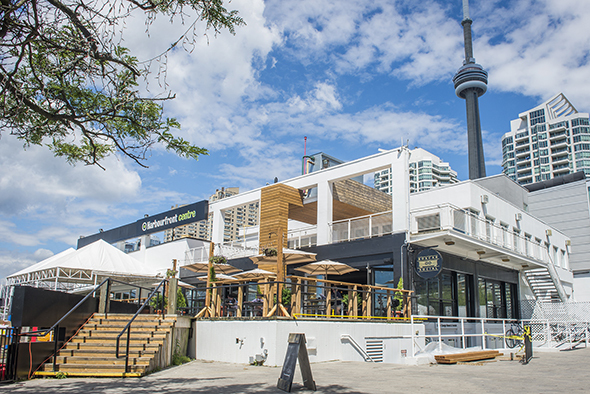 Boxcar Social's third location can be found inside the Harbourfront Centre building, replacing what was previously the lacklustre Lakeside Local Bar & Grill. 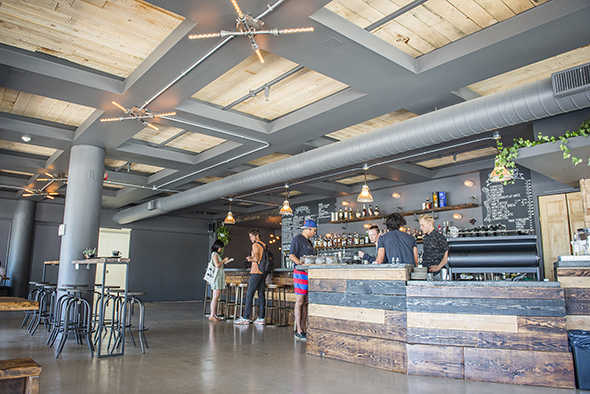 Like The Slip , it's a partnership between the Boxcar owners and Harbourfront: its CEO, Marah Braye, is a regular at Boxcar's Summerhill location and she asked the Boxcar boys to help reinvigorate the waterfront with their distinctive brand of cafe-bar hybrid. 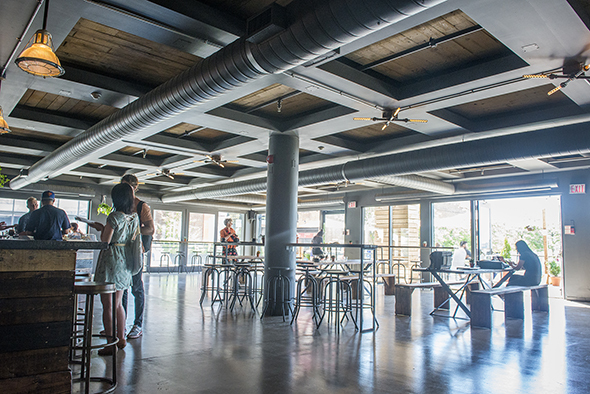 Unlike The Slip, this 200-capacity spot is open year-round, although it's particularly sweet in the summer with its patio overlooking the Natrel Pond (Natrel Rink in the winter) and Lake Ontario beyond that. 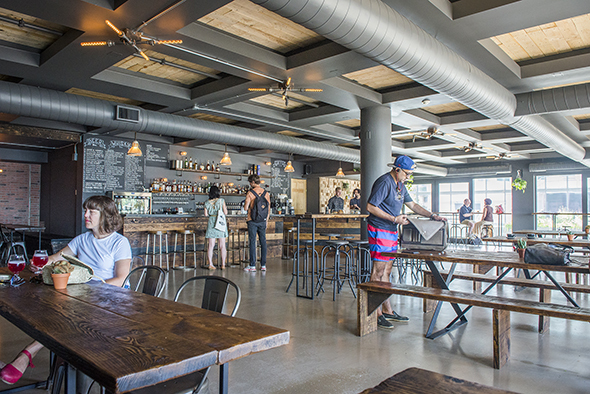 Inside, the space has a look and feel similar to the other Boxcar locations; a pleasing, industrial-chic mix of wood furniture that the owners built themselves (save a few stools) with considerate details like small hooks for coats or bags attached to the tables, along with leafy vines and succulents as natural decorative accents throughout. 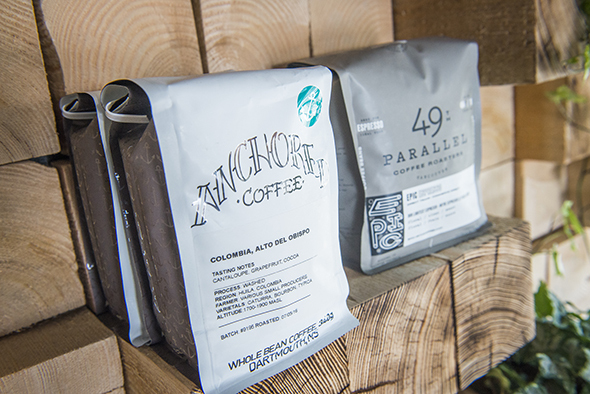 As is customary for Boxcar, its discerning coffee program here offers a rotating list that focuses on harder-to-find, third-wave roasters from outside of Toronto. During my visit, the featured roasters are Vancouver's 49th Parallel, Calgary's Phil & Sebastian, Edmonton's Transcend and The Barn, from Berlin. 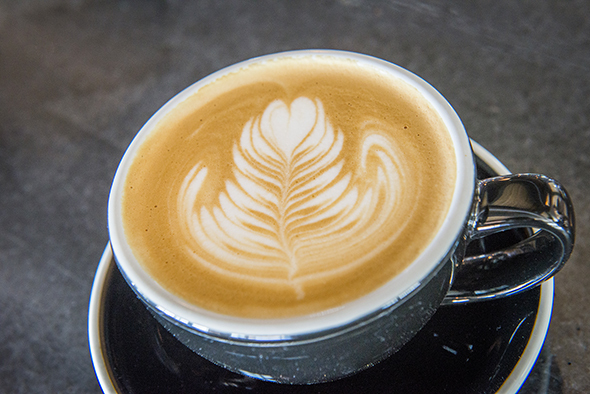 I try a latte ($4.50) made with naturally processed Brazilian beans roasted by Transcend; it's the recommended featured espresso bean to go with milk, as it has a nutty flavour with hints of chocolate. It arrives perfectly made, lovely latte art and all, and is a pleasure to drink. Since this is expected to be a high-traffic area, there is no separate slow bar like the one at the Riverside location . However, this Harbourfront outpost is the only Boxcar (for now?) 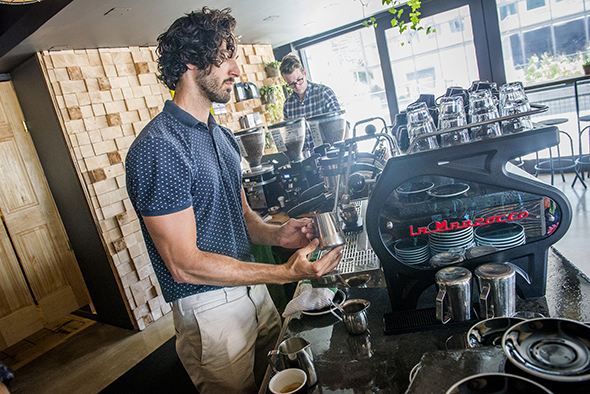 equipped with a Marco SP9 coffee brewer (a.k.a., "the Splurty") to help make the often time-consuming and painstakingly precise pour-over-making process more efficient. Coffee and/or whisky tasting flights ($7.50-$15) are available, and as Boxcar patrons have come to expect, the bar portion of the biz only encompasses beer, whisky and wine (for cocktails, there's Clocktower Bar up in Summerhill). With about 20 craft beers and at least a couple of ciders on tap ($6-$6.60 for 13oz. ), there's a ton to try here, including local brews from Burdock , Blood Brothers , Henderson and Muddy York . A good selection of whisky ($8-$18 for 1oz.) 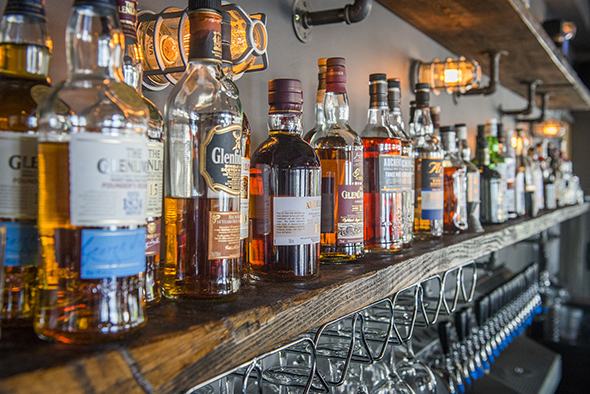 mostly focuses on Scotch and Bourbon plus a few options each for Irish whiskey or rye. 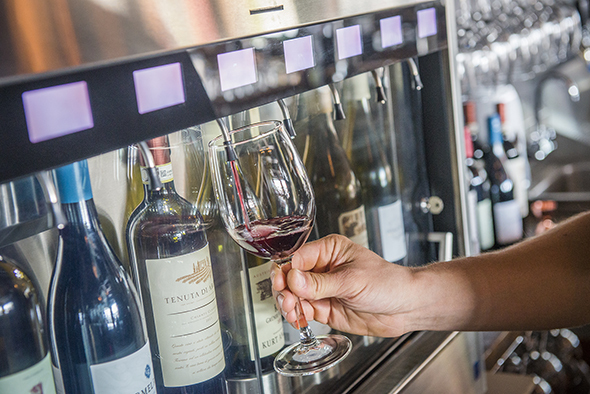 An Enomatic wine dispensing system allows the bar to offer over half of its wines by the glass ($9-$14; $40-$90 by the bottle), with both Old and New World grapes represented. We try a glass of the 2013 Chianti Classico from Tenuta di Arceno in Tuscany ($14; $65 bottle) and it goes down smooth; it's medium-bodied and balanced with a bright acidity and soft tannins. It's a great recommendation. 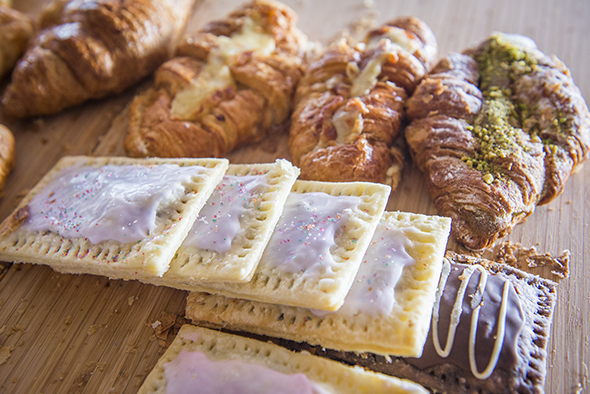 Eats-wise, there are baked goods ($2.35-$4.20) like pistachio croissants from Delysees , plus pop tarts and squares from Bake Shoppe , who have a workspace in the back kitchen. For lunch, soups ($5) and sandwiches ($7, or $10 with soup) are at the ready. 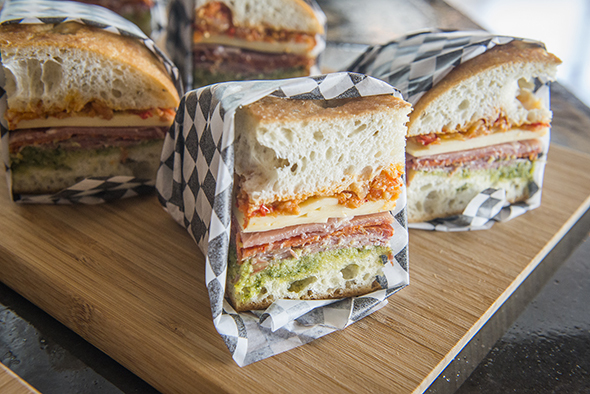 When we visit, it's gazpacho (a good choice for a hot summer's day) and muffaletta. This area very much needed something like this; it's a gorgeous place to hang out during the day (before or after a visit to the Power Plant , which is right next door), and makes for a great night time option, giving the Harbourfront a refreshing injection of hip sophistication.